* The Mikoyan MiG-29 "Fulcrum" was one of the Soviet Union's most important combat aircraft in the last years of the Cold War, and remains an important military asset for the successor Russian Republic. It has been widely exported, and is now being updated with improved systems to keep it in service well into the 21st century. This document provides a history and description of the MiG-29. * In the late 1960s, the US Air Force began work on the development of a next-generation fighter under the "Fighter Experimental (FX)" program. In 1969, McDonnell Douglas won the FX competition with what would become the "F-15 Eagle." The Soviet Union followed the FX program with great interest. Obviously, if the West had improved fighters, the VVS (Voyenno Vozdushniye Sily / Red Air Force) USSR had to have comparable fighters to counter them, and that same year, 1969, the Soviet government issued a requirement for an "anti-F-15" heavy fighter, under the designation "Prospective Frontal Fighter (Perspektivnyi Frontovoi Istrebitel / PFI)". Both the Mikoyan and Sukhoi experimental design bureaus (OKBs in the Russian acronym) began work on PFI concepts, basing their designs on recommendations from the "Central Aerodynamics & Hydrodynamics Institute (Tsental'ny AeroGidrodinamicheski Institut / TsAGI)". The PFI requirement was extremely ambitious, specifying long range; sophisticated weapons and fire-control systems; high performance; superior agility; and operation from short, rough airstrips. As it turned out, the requirements were so ambitious they could not be reasonably met with a single type of aircraft. Recognizing the problem, MiG OKB Director Artem Mikoyan successfully lobbied to split the PFT specification in two, resulting in 1970 in the "Heavy PFI (Tyazholyi PFI / TPFI)" and "Lightweight PFI (Logiky PFI / LPFI)" specifications. In fact, the US Air Force had come to a similar conclusion, if through a somewhat different line of reasoning, and had followed up the F-15 program with a lightweight fighter effort of their own, which would result in the General Dynamics F-16 Falcon. Mikoyan was forced to step down as director-general of the MiG OKB after a heart attack, and then died on 9 December 1970. His place was taken by Rostislav Belyakov. Under Belyakov's direction, the MiG bureau went forward on both TPFI and LPFI designs. The MiG OKB developed a number of TPFI design concepts, but the Sukhoi OKB won the competition for the TPFI requirement, resulting in what would become the Sukhoi Su-27. The MiG heavy fighter designs were never built. The MiG lightweight fighter design, with the bureau code number "9-11", won the LPFI award, and would become the MiG-29 as it is known today. The MiG-29 was to replace MiG-21, MiG-23, Su-7, and Su-17 fighters in the VVS "Frontal (Tactical) Aviation (FA)" component. The primary mission of the MiG-29 was to be battleground air superiority, though it would have a secondary attack role. The development work went forward under a team under Mikhail Waldenburg. The VVS was confident enough in the MiG-29 design to award a production contract along with the development assignment. * The initial prototype, number "901", performed its first flight on 6 October 1977, with MiG OKB chief test pilot Alexander Fedotov at the controls. It was followed by three more development prototypes, numbered "902" though "904", with shorter nose gear and other changes. The "903" development prototype was lost when its engine caught fire in flight on 15 June 1978, the pilot, Valeriy Menitskiy, ejecting safely. It was replaced by a new "908" development prototype, but ironically this aircraft was lost as well under similar circumstances on 31 October 1980, the pilot, Alexander Fedotov, also ejecting safely. Western intelligence was aware of the development effort, a US spy satellite having spotted one of the MiG-29 prototypes at the Zhukovsky flight test center in November 1977. Since the proper name of the secret center was not known to Western intelligence at the time, the site was referred to as "Ramenskoye" after the name of a nearby town, and so the mystery aircraft was assigned the designation "Ram-L". Nine pre-production prototypes, numbered "917" through "925", followed the development prototypes, the last of this series of aircraft performing its initial flight in December 1982. Of course, each successive aircraft in this sequence was closer to full production specification, with the final "925" prototype serving as the model for operational aircraft. Production MiG-29s went into service with the VVS-FA June 1983. All the prototypes and production single-seaters had the bureau code number of "9-12". The design was fundamentally the same as that of the original 9-11 concept, though the 9-12 had a longer nose, taller tailfins, and a simplified canopy. Once Western intelligence acquired reliable details of the new type, the first-generation MiG-29 was given the NATO reporting name "Fulcrum-A". The USSR finally publicly "unveiled" the type to the West with a visit to Finland in July 1986. * Following the Finland visit, commentaries on the MiG-29 ran wild in the Western aviation press. Critics sniped that it was a warmed-over rehash of Western designs and technologies, but the reality was that the fighters of the era drew on a similar pool of design concepts, and resemblances between them were almost inevitable. The 9-12 MiG-29 Fulcrum-A was mostly built of aluminum alloy, with some use of composite materials. The aircraft had a high-mounted wing, all-moving tailplanes, and twin tailfins with a slight outward cant. Flight controls were hydraulic. The wing was blended to the fuselage, with leading-edge root extensions (LERXs) and full-span leading-edge maneuvering flaps. There were conventional inboard flaps and outboard ailerons on the trailing edge of the wing. A dive brake was fitted to the back of the aircraft, with another fitted to the belly. Early production Fulcrum-As had small ventral fins on the bottom of the tail, directly under the tailfins, but they were judged unnecessary and deleted. Chaff-flare dispensers were then added, in the form as distinctive "strakes" fitted on top of the wing as forward extensions of the tailfins. Each dispenser could accommodate 30 chaff cartridges or 30 flare cartridges, for a total load of 60. This addition was a direct consequence of Soviet combat experience in Afghanistan, where American "Stinger" heat-seeking man-portable surface-to-air missiles (SAMs) provided to the Afghan mujahedin warriors had proven a dangerous threat to Soviet aircraft. The Fulcrum-A was powered by twin Klimov RD-33 afterburning bypass turbojets, with 49.4 kN (5,040 kgp / 11,100 lbf) dry thrust and 81.4 kN (8,300 kgp / 18,300 lbf) afterburning thrust each. Two engines were selected to improve aircraft survivability. The engines were in separate housings under the fuselage. To permit operation from rough fields, each main intake had a door that closed whenever the main landing gear was in touch with the ground to prevent "foreign object damage (FOD)" from engine ingestion of stones and the like. When the doors were shut, the engines obtained airflow from spring-loaded louvers on top of the wingroots. The transition between the louvers and the front intakes was said to be smooth and almost unnoticeable. There was a container between the engine exhausts that stored a cruciform drag parachute. The Fulcrum-A had a built-in single-barreled GSh-301 30-millimeter cannon with 149 rounds firing out the left LERX, for close-in dogfighting and ground attack. The initial prototype had featured a two-barreled GSh-23-2 23-millimeter cannon, but the heavier weapon was adopted for all later MiG-29s. The aircraft had three stores pylons under each wing, for a total of six. In the air-superiority role, it carried a mix of two "beyond visual range (BVR)" "R-27R / AKU-470" semi-active radar homing (SARH) air-to-air missiles (AAMs), with the NATO reporting name of "AA-10 Alamo-A", and four "R-60 (NATO AA-8 Aphid)" AAMs or "R-73 (NATO AA-11 Archer)" heat-seeking short-range "dogfighting" AAMs. The R-73 / AA-11 Archer was one of the first "off-boresight" AAMs, capable of being locked on a target using a helmet-mounted sight, provided as part of the Fulcrum-A's kit. It is regarded as agile, with good counter-countermeasures, and vastly superior to the R-60 / AA-8 Aphid, which was only carried by Soviet MiG-29s early on. However, export users rarely got the R-73 / AA-11, and had to make do with the R-60 / AA-8. The Fulcrum-A could also occasionally carry a single long-range "R-27B (NATO AA-10 Alamo-B)" heat-seeking missile in place of one of the R-27R Alamo-As. The Alamo-B allowed long-range attacks without requiring telltale radar emissions from the launch aircraft. The outboard pylon on each wing was reserved for AAMs, and could not be used to carry attack stores. The inboard pylon on each wing was "wet" and could be used to carry a 1,150 liter (303 US gallon) external tank. A 1,500 liter (396 US gallon) external tank could be mounted on the centerline for ferry flights. Although the Fulcrum-A lacked the combat avionics systems for the strike role, it could carry dumb bombs and unguided rocket pods, and it is believed that some MiG-29 squadrons were equipped with the RN-40 tactical nuclear weapon. The Fulcrum-A was fitted with two sensors: a Phazotron "N-019 (NATO Slot Back)" pulse-Doppler multimode radar, and an "infrared search and track (IRST)" sensor combined with a laser rangefinder. They were regarded as effective, but not the equal for contemporary Western systems. Pilot workload was high by Western standards -- though this was not seen as a major problem, since Soviet doctrine relied on "ground controlled intercept (GCI)" tactics, with the aircraft being guided to a target semi-automatically by a ground station, the pilot more or less merely acting as a supervisor. Cockpit layout for the Fulcrum-A was generally regarded as middling to poor, even by the standards of its era. It had an analog layout, though it did feature a head-up display (HUD) and limited "hands on throttle and stick (HOTAS)" controls. In some compensation, the MiG-29's cockpit layout did have a clear evolutionary relationship with those of the MiG-21 and MiG-23, easing pilot conversion. In another compensation, a Fulcrum-A pilot sat on one of the best ejection seats in the world, the rocket-boosted Zvezda "K-36D" seat with "zero-zero (zero speed, zero altitude)" capability. The West got an impressive demonstration of the K-36D at the Paris Air Show in 1989, when pilot Anatoliy Kvotchur had to leave his MiG-29 in a big hurry after losing an engine due to a birdstrike. The ejection seat got him out neatly in the split second before the aircraft smashed into the ground and became a fireball. * The Fulcrum-A was very agile, though since it lacked the advanced fly-by-wire (FBW) flight controls of its Western counterparts, that meant it placed a premium on pilot skill. Flight controls had "soft limits", allowing the pilot to exceed recommendations if needed. However, the MiG-29 was not an unfriendly machine either, giving plenty of warning before departing controlled flight. It also did not spin easily, and a spin could almost always be easily corrected by neutralizing the controls. The MiG-29 had good handling at low speeds and remained controllable at very high angles of attack. The Fulcrum-A was regarded as more agile than its Western counterpart, the F-16A, and was a particularly dangerous adversary in a low-speed turning fight. Its biggest limitation was poor range, sometimes being described as a "fighter for use over the airfield beacon". The "9-12A MiG-29A" was intended for export to Warsaw Pact allies. It was almost identical to the standard 9-12 MiG-29, but didn't have wiring for nuclear stores and had simplified avionics. The "9-12B MiG-29B" was intended for exports to nations outside the Warsaw Pact. It was a further simplification of the standard 9-12 MiG-29, with highly stripped-down avionics. Both retained the "Fulcrum-A" reporting name. While production quantities of MiG-29s are unclear, it appears that a total of about 840 Fulcrum-As was built for the VVS-FA and for export. * Although the MiG-29 was basically docile, it was still a high-performance aircraft, and the MiG OKB accordingly developed a tandem two-seat operational conversion trainer, designated "9-51 MiG-29UB". First flight of the initial prototype was on 29 April 1981, with Fedotov at the controls. The second cockpit was not raised significantly, since that would have degraded performance. As a result, the back-seat instructor had a poor forward view, but was provided with a periscope that popped up when the landing gear was extended to provide a better forward view. Some fuel capacity was deleted to make space for the back-seat cockpit. Since the MiG-29UB was not intended to be combat-capable, the chaff-flare dispenser strakes were not fitted, and the N-019 radar was replaced by a onboard simulator module. The MiG-29UB had the 30-millimeter cannon and could launch heat-seeking AAMs, but not radar-guided AAMs, and had no target tracking capability. Removal of the radar gave the MiG-29UB a smaller nose that arguably improved its appearance. The "UB" suffix was misleading, since it stood for "Uchebno-Boevoi (Trainer-Combat)" when the variant was effectively a trainer. NATO swallowed this misinformation, giving the type the reporting name "Fulcrum-B" instead of assigning it the "M"-series reporting name normally given to trainers, such as "Midget" for the MiG-15UTI or "Mongol" for the MiG-21UB. Russian crews called the MiG-29UB the "Sparka (Twin)", a general name for a two-seat trainer. * While the 9-12 MiG-29 Fulcrum-A was going into volume production, the MiG bureau had been considering a refinement of the type, the "9-13", with tests of kit on various modified Fulcrum-As leading to the first flight of a new-build prototype in 1986. The new variant retained the "MiG-29" designation, but it seemed visibly different enough from the original Fulcrum-A variant to be given a new reporting name of "Fulcrum-C" by NATO. The main difference was a swollen spine, which led Soviet MiG-29 pilots to call the Fulcrum-C the "Gorbatyi (Hunchback)". Some sources claim the MiG-29 Fulcrum-C introduced the underwing fuel tanks -- but given the poor endurance of the original MiG-29, it seens hard to believe they weren't there at the outset. Western analysts interpreted the Fulcrum-C's swollen spine as accommodation for increased fuel capacity to improve on the Fulcrum-A's limited range. In fact, the fuel capacity increase of the Fulcrum-C was modest -- 240 liters (63 US gallons), and most of the expanded space was used to house a "Gardeniya" active jammer module. The updated avionics suite also led to modifications of the wingtips and addition of antennas to the tail. About 200 Fulcrum-Cs were built, with initial introduction to service in 1986. They were not exported, due to worries over the security of the countermeasures system. 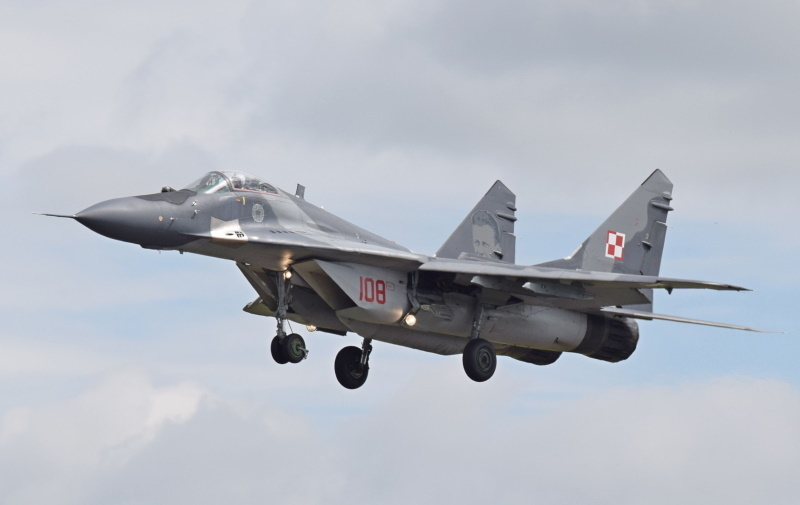 * The MiG OKB continued to make further tweaks that resulted in a set of "MiG-29S" demonstrators, which retained the NATO "Fulcrum-C" reporting name, since external appearance remained largely unchanged. The MiG-29S featured a modernized "N-019M" radar, a Is-101M processor, and an improved jammer; only 16 were built. De-tuned variants were offered for export, including the "MiG-29SD" and "MiG-29SE"; it doesn't appear anybody obtained them. New RD-33K afterburning bypass turbojets, providing 54.0 kN (5,500 kgp / 12,125 lbf) max dry thrust and 86.3 kN (8,800 kgp / 19,400 lbf) afterburning thrust each -- along with an "emergency" afterburning mode that could increase thrust to 92.2 kN (9,400 kgp / 20,725 lbf) on a redline basis for very short periods. The engines also featured greater reliability and simpler maintenance. Redesigned LERXs, with the intake louvers on top eliminated and FOD protection provided by intake screens. In the time-honored Soviet tradition of "maskirovka (masquerade / deception)", early MiG-29Ms apparently had louvers painted on the LERXs to camouflage the fact that they were new-model aircraft. Removal of the louvers was part of a redesign of the internal fuel tank arrangement, which was enlarged to provide the MiG-29M with a third more range. The larger fuel tanks led to a reduction in size of the ammunition box for the 30-millimeter cannon from 149 to 100 rounds, but this was not felt to be much of a penalty, since the cannon had proven both accurate and hard-hitting in practice, and 100 rounds was felt to be plenty. A fat spine along the lines of that of the Fulcrum-C, accommodating a chaff-flare dispenser system and eliminating the need for the strake chaff-flare dispensers. Modified flight surfaces, with a distinctive small dogtooth between the LERX and the wing, and the top-bottom airbrakes replaced by a single enlarged ventral airbrake. The result was an aerodynamically cleaner and even more agile aircraft. New airframe assemblies of lithium-aluminum alloy and composite materials to reduce weight, simplify manufacture, and increase the useful internal volume of the aircraft. Unfortunately, despite the great expense of the lithium-aluminum alloy assemblies, they did not give the MiG-29M the hoped-for weight reductions. The MiG-29M was still significantly heavier than the Fulcrum-A, and so the landing gear was reinforced, while the single drag chute was replaced by twin drag chutes, released from a new "beavertail" fitting between the engine exhausts. Two side-by-side chutes were used instead of one big chute, since a larger chute would have scraped the runway. Improved IFF and active jammer systems, as well as an electronic FBW control system. The FBW system was based on analog electronics, probably because a fully digital system was a bit ahead of Soviet capabilities at the time, but the MiG bureau played up the simplicity, reliability, and resistance to electromagnetic interference of the analog system. The FBW system provided triple redundancy for roll and yaw control and quadruple redundancy for pitch control, while still allowing the pilot to "redline" the aircraft. Modernized cockpit systems to reduce pilot workload. The cockpit included two monochrome CRT displays and much more capable HOTAS controls, and the pilot was given an improved helmet-mounted sight. The pilot's seat was raised to provide a better view, and as a result the canopy was distinctively bulged compared to earlier MiG-29s. The new Phazotron "N-010 Zhuk-M" multimode radar system, with a flat slotted planar antenna instead of a dish antenna; about 25% greater range; much improved processing power and software; and several new modes, including terrain-following and new air-to-ground capabilities. The N-010 radar was fitted into a smaller, reprofiled nose radome. The TV-guided "Kh-29T" and laser-guided "Kh-29L" missiles, both known as "AS-14 Kedge" by NATO, and basically the same weapon with different seeker heads. The TV-guided "KAB-500Kr" and laser-guided "KAB-500L" 500-kilogram (1,100 pound) glide bombs. The MiG-29M could also carry the advanced "R-77" (NATO "AA-12 Adder") AAM, sometimes referred to as the "AMRAAMski", since it is comparable to the US AIM-120 AMRAAM missile. The R-77 has a range of about 100 kilometers (60 miles), and a fully active radar seeker for "fire and forget" operation. * Six MiG-29M prototypes were flown, but the type did not enter production for the Russian Air Force. The development of the MiG-29M coincided with the collapse of the Soviet Union, effectively shutting down MiG-29 production. By that time, 620 Fulcrum-A and 528 Fulcrum-C single-seaters had been built, as well as 197 Fulcrum-B trainers. The halt in production meant many unfinished airframes were left at the factories, which provided a feedstock for future sales. The Russian Air Force focused on the Su-27 during the Yeltsin era. Both the MiG-29 and the Su-27 were air-superiority fighters, and the MiG-29 wasn't that much cheaper; the Su-27 was the obvious preference. The MiG-29M effort sputtered along on various hopes into the mid-1990s, and then finally went into limbo. Attempts to develop an export version, the "MiG-29ME", were not successful. * The MiG OKB also developed a carrier-based advanced MiG-29 variant, the "9-31 MiG-29K", in parallel with the MiG-29M. The MiG-29K could be considered a "navalized" MiG-29M, differing in the fit of ruggedized landing gear; an arresting hook; new, extended, hydraulically-folding wings, with a double slotted flap system to improve low-speed landing; corrosion protection, including navalized RD-33K engines; and a retractable inflight refueling probe. Production aircraft were to have a fully automatic carrier landing system. Work on the MiG-29K began in 1984. The initial development prototype was modified from an older MiG demonstrator and designated the "MiG-29KVP". It lacked folding wings and double slotted flaps, and may not have had ruggedized landing gear. The MiG-29KVP was used to demonstrate arrested landings, as well as "ski-jump" takeoffs, as the Soviets were having troubles developing catapult systems for the carriers they were building. Tests were apparently mostly conducted on a land-based replica of a carrier deck in the Crimea, since it could not perform a true carrier landing without reinforced landing gear. The first flight of a true MiG-29K prototype was on 23 June 1988. It was followed by a second prototype. The fall of the USSR meant the MiG-29K also didn't enter production, at least as it was originally conceived. A two-seat trainer, with a stepped independent rear cockpit for the flight instructor to provide an adequate view on steep carrier landings, was considered but not built. * The failure of the MiG-29M and MiG-29K to enter production meant lean times for the MiG OKB, whose fortunes seemed to be on a steady decline in the new Russia. 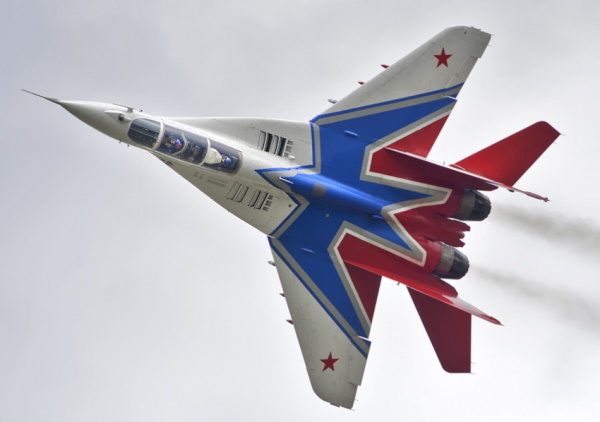 Outside observers wondered of the great name of MiG might be headed for extinction, as it steadily withered during the 1990s while the Sukhoi organization was awarded new fighter contracts. The only business was in "MiG-29SM" upgrades of existing aircraft, this being a modest update to add air-to-ground capabilities, initially with TV-guided missiles and bombs being carried, their seeker imagery fed into the cockpit display. Carriage of the Kh-31A/P antiship / antiradar missile was added later, with the N019M radar updated to N019MP to permit ground-attack / ship-attack targeting, and the Pastel RWR coupled with an external pod to permit targeting of radar "emitters". The MiG-29SM was just a start, however, with the the new "Rossiskaya Samoletostroitelnaya Korporatsiya MiG (RSK MiG)" organization moving on to promote a range of improved MiG-29 variants. While a ground-up redesign like the MiG-29M was out of the question, major improvements could be made with less drastic changes that could be implemented in either new-build aircraft or as upgrades to existing aircraft. 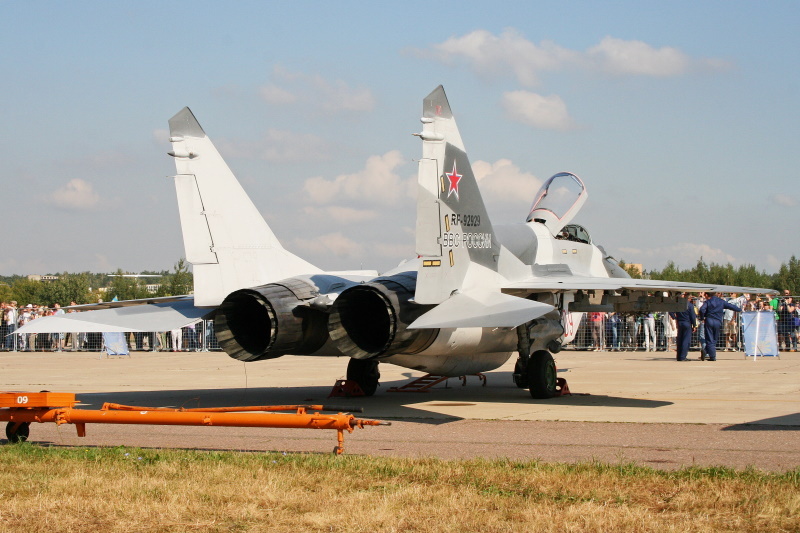 The Russian Air Force wanted to upgrade over 400 existing MiG-29s, providing a strong incentive. The result was the "9-17 MiG-29SMT", which could be considered a revival and extension of the various MiG-29S upgrade efforts of a few years earlier. The MiG-29SMT featured a glass cockpit based on that of the MiG-29M, but with twin 15 by 20 centimeter (6 by 8 inch) full-color flat panel LCDs, instead of the smaller monochrome CRTs using the MiG-29M, as well as two smaller monochrome LCDs. Modern HOTAS controls were implemented as well, and the MiG-29SMT also featured a MIL STD-1553B compatible digital databus to link the cockpit and the avionics systems. An advanced navigation system, using laser gyros and a satellite positioning system receiver, was fitted, as well as built-in diagnostic systems to ease maintenance. To deal with the range issue, the MiG-29SMT featured a particularly swollen "hunchback" spine, and could also could be fitted with a bolt-on inflight refueling probe. The spine terminated in a beavertail like that of the MiG-29M, which could accommodate one or two parachutes, as required by aircraft load. The MiG-29SMT retained the top-and-bottom airbrake scheme of the Fulcrum-A, though the dorsal airbrake was larger, and also retained the old scheme of chaff-flare dispenser strakes. Old MiG-29s upgraded to the MiG-29SMT specification were to be refurbished to give them 20 years of airframe life. Unrefueled range of the MiG-29SMT was cited as 2,200 kilometers (1,370 miles) without external tanks, almost half again as great as that of Fulcrum-A. Multirole capabilities were provided by an improved N-019M Slot Back radar, with greater range, wider field of view, and the ability to track ten targets at once. External targeting and reconnaissance pods could also be carried. The MiG-29SMT could use all the advanced weapons that were qualified for the MiG-29M, with a total external stores load of 4,000 kilograms (8,800 pounds) on six stores pylons. Although early MiG-29SMTs retained the old RD-33 engines, full-specification machines were to be fitted with more powerful Klimov RD-43 engines with over 10,000 kilograms (22,000 pounds) afterburning thrust. Initial flight of the first MiG-29SMT prototype was on 29 November 1997, with Marat Alykov at the controls. This machine was a modification of a company demonstrator that had already been used in the earlier MiG-29S effort, and did not include all the features expected for the "production" MiG-29SMT. The first full-standard MiG-29SMT, also a conversion of a company demonstrator, performed its first flight on 14 July 1998, piloted by the MiG organization's new chief test pilot, Vladimir Gorbunov. This aircraft was demonstrated at the Farnborough Air Show in the UK in 1998. * RSK MiG followed up the MiG-29SMT with a similar effort to produce a second-generation two-seater, the "9-51T MiG-29UBT", essentially a company 9-51 MiG-29UB fitted with improvements developed for the MiG-29SMT. The MiG-29UBT featured a swollen spine to store more fuel, with the larger dorsal airbrake and the beavertail of the MiG-29SMT, and also could be fitted with a bolt-on inflight refueling probe. The front-seater's cockpit layout was very much like that of the MiG-29SMT; the back-seater still had flight controls, but the rear panel layout also featured a large CRT to display TV or infrared camera imagery provided by external pods. While the MiG-29UBT could be used as a trainer, its focus was clearly for roles such as precision strike, with the back-seater targeting and guiding smart munitions while the pilot flew the aircraft. No radar system was fitted to the MiG-29UBT demonstrator, but production machines were to be fitted with an advanced multimode radar. * RSK MiG saw the MiG-29SMT as a demonstrator for a "Chinese menu" of possible upgrades, ranging in sophistication from a simple airframe overhaul with fit of a refueling probe and low-cost avionics improvements -- to the full-blown MiG-29SMT configuration, possibly even adding the high-end N-010 Zhuk-M radar. The path towards upgrade of Russian MiG-29s was torturous. Limited funding kept the Russian Air Force from making any commitment to upgrades for years, but in 2005, with the economy doing fairly well from oil exports, the service decided to begin an upgrade of the MiG-29 fleet, focused on adding a strike capability. This upgrade actually featured avionics developed for the Su-30 / Su-27 upgrade to reduce cost and logistical overhead, and retained the old N-019 radar with some upgrades. The airframes were overhauled and reinforced to carry heavier warloads. The VVS also obtained 28 new-production MiG-29SMT fighters in 2009 and 2010, these machines having been built for a deal with Algeria that fell through, and ordered 16 more in the spring of 2014, as a first installment on what will amount to a buy of 100 machines, with initial delivery at the end of 2015. * The Indian Air Force (IAF) was an early export user of the MiG-29, having obtained 70, including 5 two-seaters, from 1985 -- as early adopters they suffered from some technical problems, but they were eventually resolved. The Indian Navy was similarly an early export buyer of next-generation MiG-29s, obtaining 12 multirole "9-41 MiG-29Ks" for use on the carrier VIKRAMADITYA -- formerly the ADMIRAL GORSHKOV, which India purchased from Russia. The carrier was refurbished, being given a "ski jump" deck, and went into service with the Indian Navy in 2012. The Indian MiG-29K -- here referred to as the "MiG-29KI" for to convenience, though that's not a formal designation -- was not the same as the navalized MiG-29K developed in the late 1980s. The MiG-29KI could be described as a MiG-29SMT with the navalization features of the MiG-29K, such as longer, folding wings; arresting gear; stronger landing gear to handle heavier warloads; eight stores pylons; and RD-33-3M navalized engines, featuring corrosion protection. Both the prototypes for the MiG-29KI were actually modifications of the two MiG-29K prototypes. The MiG-29KI featured folding tailplanes and a folding nose radome to further reduce the aircraft's deck footprint. Production aircraft use the new, uprated RD-33-10M bypass turbojet with 4.76 kN (10,500 kgp / 23,150 lbf) thrust. The variant also featured a digital FBW system; N-010 Zhuk-M radar; state-of-the-art Geofizika OLS-M optical-infrared imager and laser targeting system; a modern helmet-mounted sight; radar homing and warning system. The type was fitted with Indian-specified inertial navigation system, IFF, and countermeasures systems. Along with the MiG-27KIs, India purchased four two-seat "9-47 MiG-29KUBs" as part of the order, essentially a navalized MiG-29UBT, fitted out in much the same way as the MiG-29KI with folding wings, arresting gear, and so on. Initial flight of the first MiG-29KUB was in the summer of 2008. A follow-on batch of 29 navalized MiG-29s was ordered in 2010. The Indian Navy MiG-29s were well in advance of their IAF counterparts, but the IAF signed a contract to upgrade their 69 surviving machines. The upgrade will feature a glass cockpit, Zhuk-ME radar, RD-33 engines, and midair refueling capability. The initial six were to be upgraded in Russia, with the first refurbished aircraft flying in early 2011 and initial deliveries in late 2012. The rest were updated by Hindustan Aerospace LTD (HAL) in India, with final deliveries in 2013. * RSK MiG has promoted land-based counterparts to these Indian Navy variants in the form of the "MiG-29M1" single-seater and "MiG-29M2" two-seater. These machines retain the folding wings of the naval fighters but have some changes in kit. A demonstrator was also flown in 2003 with RD-33MK engines featuring vector-thrust nozzles that could be rotated 15 degrees in any direction. Myanmar did place an order for twenty MiG-29K machines in late 2009, but the exact configuration of these machines is unclear. In 2012, the Russian Navy placed an order for 20 "MiG-29KR" fighters and 4 "MiG-29KUBR" two-seaters, for operational service on the Russian Navy's sole aircraft carrier, the ADMIRAL KUZNETSOV. These machines appear to be very similar to their Indian Navy equivalents; deliveries began in late 2013, to be completed by 2015. The VVS intends to obtain the improved "MiG-35" single-seater and "MiG-35D" two-seater, with improved avionics, most significantly a Phazotron Zhuk-AE "active array" radar now in development, as well as extended range. Pre-production machines began flight tests in 2016, with introduction to service expected in 2018. The Russian Air Force -- rendered from 2015 as "Russian Aerospace Forces (Vozdushno-Komicheskiye Sily / VKS) -- though they are seen as a training asset, the service preferring the Sukhoi Su-30 fighter. The MiG-29 is not that much cheaper than the Su-30, and the Su-30 is more capable. * Although the VKS has more or less given up on the MiG-29, substantial numbers were passed on to other "successor states" of the Former Soviet Union -- including Belarus, Kazakhstan, Moldova, Turkmenistan, Ukraine, and Uzbekistan. 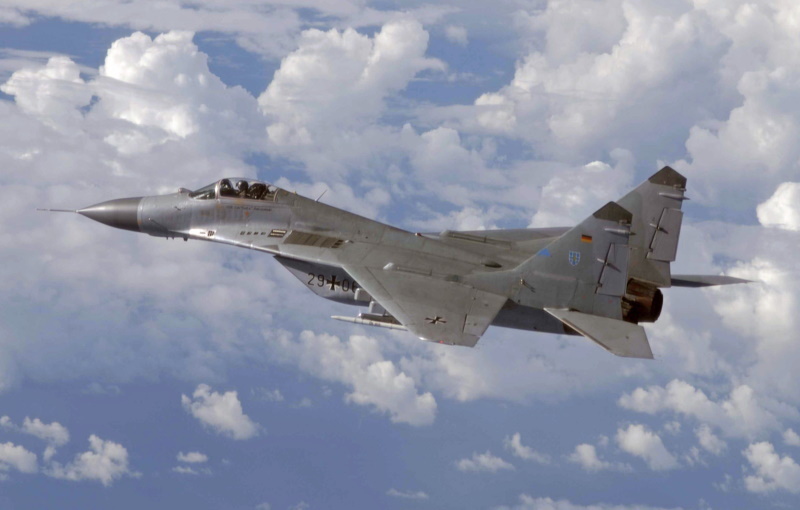 Of course, many Eastern European nations received the MiG-29, countries flying the type including Bulgaria, Czechoslovakia, East Germany, Hungary, Poland, Romania, and Yugoslavia -- with Serbia inheriting the ex-Yugoslavian MiG-29s. African nations that obtained the MiG-29 included Algeria, Eritrea, and Sudan; Middle Eastern nations included Iraq, Iran, Syria, and Yemen. Besides India, Asian nations that obtained the MiG-29 included Bangladesh, Malaysia, and North Korea. The only New World nations to obtain the MiG-29 for operational service were Cuba and Peru. However, the US obtained 21 MiG-29s from Moldova for adversary training and evaluation. It is believed these aircraft have been mothballed. At least four used MiG-29s were obtained from various sources by an American firm named "Air USA" to fly as "aggressors" in military training exercises. Trying to pin down the status of the world's MiG-29 fleets is difficult. Some states have retired them, while some still have them in service, and in some cases have updated them to keep them current. Further complicating the issue is that there's been a lot of trade in old MiG-29s, the post-Soviet states being a source of MiG-29s for African and other states. East German MiG-29s actually flew for a time with the Luftwaffe of the reunited Germany, not just for aggressor training but for first-line operational service; they were given some updates, but were out of service by 2006. The Czech Republic and Hungary retired their MiG-29s, replacing them with the SAAB JAS 39 Gripen; Poland partly replaced their MiG-29s with the F-16, but updated others to keep them in service. Bulgaria, Romania, Serbia, the Slovak Republic, and Ukraine have updated their machines to keep them in service. The Luftwaffe upgrades were among the first and led to the establishment of a new unified service organization, the "MiG Aircraft Product Support (MAPS) Group". Western firms have also offered upgrade programs, which has made RSK MiG even unhappier. * I've long liked the MiG-29, and I was inspired to write about it when I bought a 132nd-scale diecast model of it from Postage Stamp Planes. It was a cheap item and I couldn't pass it up. As it turned out, once I'd waded through the MiG-29's history, the model was a bit peculiar. It was MiG-29UB with AAMs, which seems a bit implausible, it was also fitted with a mixed load of AA-8, AA-11, and AA-10 AAMs, which was a slightly unusual configuration, though not outside the realm of possibility. The AAMs were very nicely done for the small scale, and the whole thing is still a pretty little piece and a good buy for the price. "MiG-29 Variant Briefing" by Jon Lake, WORLD AIR POWER JOURNAL, Volume 36 Spring 1999, 108:135. "Tomorrow's 'Fulcrum'" by Jon Lake, COMBAT AIRCRAFT, December 2000, 28:39. "New MiG-29 Export Versions Poised For Maiden Flight" by Piotr Butowski, FLUG REVUE, November 2001. "New 'Fulcrum' Family: MiG-29K, KUB, M1, M2, & OVT" by Piotr Butowski, INTERNATIONAL AIR POWER REVIEW, Volume 3 / Winter 2001:2002, 27.
v1.0.1 / 01 may 02 / Review & polish. v1.0.2 / 01 jun 02 / Added comments on the loss of PAK-FA. v1.0.3 / 01 jul 04 / Review & polish. v2.0.0 / 01 apr 07 / General rewrite and cleanup. v2.0.1 / 01 may 09 / Review & polish. v2.0.2 / 01 may 10 / Review & polish. v2.1.0 / 01 apr 12 / Russian Navy MiG-20K buy, cut comments on MiG 1.44.
v2.1.1 / 01 mar 14 / Review & polish. v2.1.2 / 01 feb 16 / Review, polish, & update. v2.1.3 / 01 jan 18 / Review, polish, & update.